Hussein. In a reflection of the sour political mood, the qualifier “French” was removed from “fries” at cafeterias on Capitol Hill. Ten years on, the turnaround is arresting. For the first time since then, France and America have been carrying out air strikes in Iraq, on Islamic State targets. France was the first ally to join the American-led campaign. This week it sent extra fighter jets to Jordan, to back up those operating from a French base in Abu Dhabi. 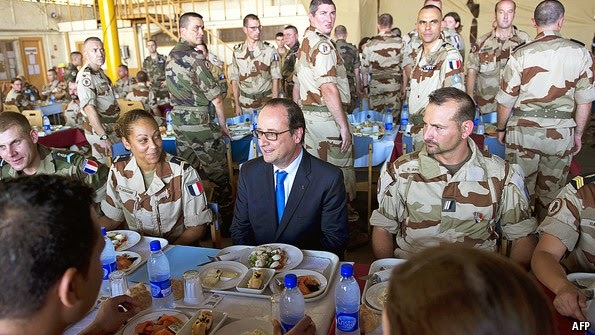 Besides its readiness to strike Iraq, France has proved hawkish on Syria and Iran, sent troops to thwart a “pre-genocidal” situation in the Central African Republic and is leading the fight against jihadism in the Sahel. “France has emerged as one of America’s most activist and steady European partners on security issues outside Europe,” notes a senior official in the White House.